During the course of his 60-year ministry, John Osteen combined an extraordinary love for people with a vision for ministry best described in his own words: "No limits." In this hardcover volume not only includes content from John's sermon transcripts, but also a foreword and commentary written by his son, Joel; the principles of this "no limits" faith come alive again for a new generation. 1. It hears and sees what the world cannot see or hear. 2. It prays earnestly even though it has already heard the answer. 3. It is strong when there is no evidence of the answer. 4. It always says, "Go Again!" 5. It goes on when there's just a little evidence. 6. It believes for the big when it sees the little. 7. It begins with nothing but ends up doing mighty things for God. 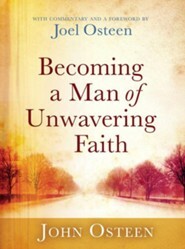 Osteen also provides principles for those times when faith doesn't seem to be working. 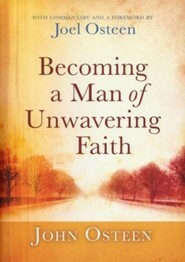 BECOMING A MAN OF UNWAVERING FAITH is a guidebook to stronger faith, from a man who spent a lifetime testing its limits. 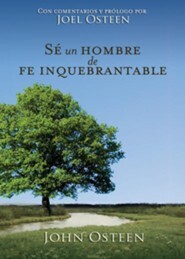 I'm the author/artist and I want to review Becoming a Man of Unwavering Faith - eBook.